The matrix of a bone lesion refers to the acellular material produced by the mesenchymal cells composing the lesion. Although many bone lesions produce no matrix, its presence can indicate the predominant cell type of the lesion. An osseous matrix is the result of abnormal osteoid production by tumor cells. It is often described as amorphous, fluffy, cloud-like, solid, cotton-like, or ivory-like on radiographs. It appears as homogeneously increased density within the bone and adjacent soft tissues. The prototype lesion with an osseous matrix is osteosarcoma. Osteosarcoma should be strongly considered if irregular, not fully mineralized bone matrix is identified on the radiograph as well as if cloud-like densities in the medullary cavity and neighboring soft tissue can be discerned. 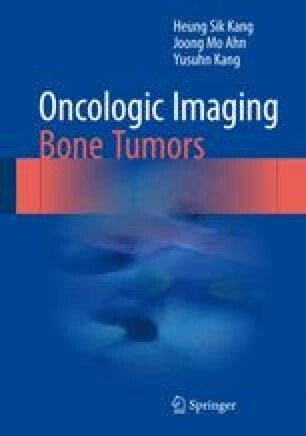 In contrast, osteoblastoma has a variable radiographic presentation from purely lytic to mixed and sclerotic. This is explained by histologic evidence that the osteoid produced by osteoblastomas is occasionally not mineralized by calcium hydroxyapatite and other inorganic salts.